The last few days, I've been posting about DVDs I plan to bring with us on our first flight with the girls next month. We'll also be toting along a bunch of books, and at the top of the pile will be Gabrielle and Alaina's new favorite, Who Said Coo? They cannot get enough of this sweet bedtime story. In the book, Lulu (which is our nickname for Alaina!) is a sleepy pig whose pals Pigeon, who "coos", and Owl, who "whoos", have shown up at bedtime and want to play. Lulu tries to send her noisy friends away but after their boo-hooing, she invites them in for a slumber party. Our copy usually comes out right before the girls are about to hit the sack themselves. Can you tell by the binky, blankie and Big Bird? The girls love the sweet illustrations and both of them enjoy telling Pigeon and Owl to "Shhhhh!" since it's sleepy time. See what I mean? I really like the fact that the rhymes have just the right rhythm for reading aloud which makes it one of the few books I don't mind repeating over and over. There's a great amount of repetition that Gabrielle and Alaina have caught on to quickly, and there are lots of opportunities for them to "coo", "whoo" and "moo" like the animals in the book do. Here's our Lulu doing her best "moo". There are also some really funny moments and a good moral about conflict resolution in the story so the girls laugh and learn. And even though the book is so interactive, the illustrations are soft, sweet and almost kind of sleepy, which make it the perfect story to read right before bed. I know that Gabrielle and Alaina have no idea that their favorite book was written by twins but it makes me happy. Maybe it's the thought that someday they'll work together on something like Debbie and Robin have. A mom can dream, right? In any case, Who Said Coo? is a read that both you and your children will love! And I've got great news because one lucky AFOMFT reader is going to win a copy of their very own! To enter to win, post a comment here telling me what your child's favorite book is (this is mandatory). And post a comment that you did. You can vote once per day per computer so if you vote every day or on different computers, be sure to post one comment for each one. Please leave a separate comment for each entry and make sure to include a link to your tweet, blog post, etc. All entries must be posted on AFOMFT as a direct comment to this post. Comments on Facebook will not count as entries. This giveaway is open to residents of the U.S. only and ends March 3rd at 11:59 pm EST. The winner will be selected by random.org and announced on AFOMFT on March 4th. If the winner doesn't contact AFOMFT within 48 hours, a new drawing will be held so be sure to check back to see if you've won! Please note that I was sent a copy of Who Said Coo? for the purpose of this review and giveaway. No other compensation was received. The opinions I've shared of this book are my own and yours may differ. Yesterday, I posted about my quest for new DVDs before our first flight with the girls. My search got so much easier thanks to Nickelodeon, who sent me five fabulous new releases to preview. 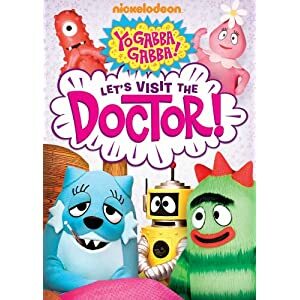 The first was a DVD of one of Gabrielle and Alaina's must-see shows, Yo Gabba Gabba, called Let's Visit the Doctor. If you haven't seen this episode, the doctor in question is played by none other than Anthony Bourdain! When Toodee gets sick, he treats her and all of the Gabbaland pals rally around her with chicken soup and fairytale stories to keep her entertained. In addition to the "Doctor" episode, this DVD also contains "Teeth", "Car" and "Clean." Gaby and Alaina love all things Gabba and who am I kidding? So do I! "Clean" actually features my favorite musical guests from YGG - Chromeo performing "Nice N Clean." It's a hoot! We also got to check out Nickelodeon Favorites: Brothers & Sisters. 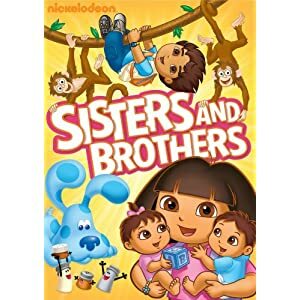 This DVD includes six episodes from five different series - Dora the Explorer, Go Diego, Go!, The Wonder Pets, Blues Clues and Ni Hao, Kai-lan - which all focus on the relationship between siblings, welcoming new family members and working out conflicts between sisters and brothers. It's a great mix of shows that keeps my girls thoroughly entertained, and with a running time of two hours, it's the perfect DVD for our upcoming trip! Up next? Dora's Ballet Adventures, which features four dance and music-themed episodes from Dora the Explorer. From Boots's birthday to Dora's first dance recital, there's lots of fun to be had here! 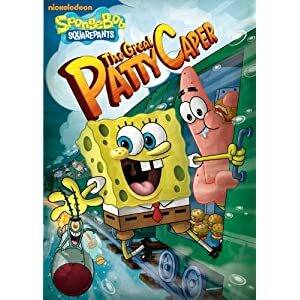 As well as SpongeBob Squarepants: The Great Patty Caper. You can purchase Yo Gabba Gabba: Let's Visit the Doctor and Nickelodeon Favorites: Brothers & Sisters now on Amazon.com, and Dora's Ballet Adventures is currently available exclusively at Target. 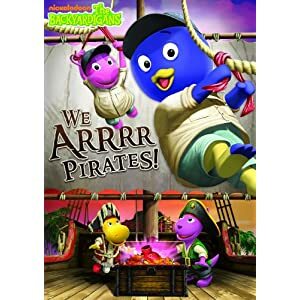 The Backyardigans: We Arrrr Pirates and SpongeBob Squarepants: The Great Patty Caper will both hit stores on March 8, 2011. I watched the first two DVDs with Gabrielle and Alaina, who thoroughly enjoyed every second of them. The last three I've chosen to give away to one lucky AFOMFT reader! To enter to win, post a comment here telling me what your child's favorite Nickelodeon show is (this is mandatory). Please leave a separate comment for each entry and make sure to include a link to your tweet, blog post, etc. All entries must be posted on AFOMFT as a direct comment to this post. Comments on Facebook will not count as entries. This giveaway is open to residents of the U.S. only and ends February 28th at 11:59 pm EST. The winner will be selected by random.org and announced on AFOMFT on March 1st. If the winner doesn't contact AFOMFT within 48 hours, a new drawing will be held so be sure to check back to see if you've won! Please note that Paramount Home Entertainment sent me the five DVDs listed above for the purpose of this review and giveaway. No other compensation was received. The opinions I've shared of their products are my own and yours may differ. We're about two months away from our first ever plane ride with Gabrielle and Alaina and I'm already in panic mode. I just don't want to be "that family" on the flight. You know, the ones with the screaming toddlers running up and down the aisle, torturing the other passengers for 3+ hours. Gah, just the thought of it makes me nauseous! To prepare, I've been asking all of my mom friends for advice on how to survive the trip and there's one universal response (well, besides "drink heavily") and that's come armed with new DVDs they haven't seen yet. Sounds simple, right? Not when it comes to my kids who seem to have already watched everything under the sun. So when I saw this trailer for Timmy Time: Timmy Steals the Show, a new DVD geared toward pre-schoolers from the creators of Wallace and Gromit, I knew it would fit the bill. Here's what it's about. 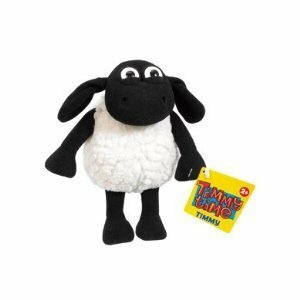 Timmy Time follows the adventures of Timmy, a little lamb with a lot to learn as he enters preschool. Used to having his way by being “the only lamb in the flock,” now that he's in school, Timmy has to graze on some important life lessons about playing nicely with others, namely his fellow classmates of the furry, feathered and spiky types. Lessons about playing nicely with others? Yeah, we need those! The DVD was released today and ours is already on the way. It's got a running time of 43 minutes, so now I only have to find something to occupy the girls for the other two hours of our flight! Want your own copy of Timmy Time: Timmy Steals the Show? You're in luck because Lionsgate Home Entertainment is giving away a DVD and this adorable Timmy plush to one lucky AFOMFT reader! To enter to win, post a comment here telling me who you'll give the Timmy Time set to if you win (this is mandatory). Happy happy Valentine's Day to all of you who read AFOMFT! As you may know, today is my birthday and there is no better gift than having more than 1,100 GFC followers, 3,000 Facebook "likers" and almost 2,000 Twitter followers. You all make my day every day. To show my appreciation, I've got a little giveaway for you. Up for grabs? Three gift cards - one for $50 to Old Navy, one for $50 to Ann Taylor Loft and one for $50 to iTunes. So how do you score one? Just leave a comment on this post. Yup, that's it. I'll draw three winners (one for each card) this Friday, February 18th at 11:59 pm so be sure to comment with something - anything - before that. And if you want to show your love in return, click the banner below to vote for AFOMFT on Top Baby Blogs. 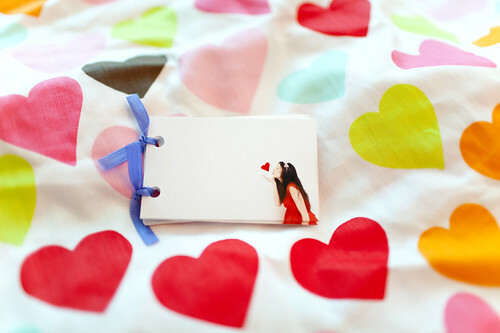 And presto - Valentine's magnets that are cute enough to use all year long! You can download the free printable circles here at It's a Crafty Life, and if you have a free Valentine's printable you'd like to share, enter it into the link up below! Get Your Game On, V-Day Style! For day 4 of the Valentine's Countdown I'm hosting over at Nickelodeon's Parents Connect, I'm sharing some great games and activities for February 14th! There are lots of fun ideas (most with free printables!) from Shindig Parties To Go, Katie Did, Make & Takes, Woo Jr., The Crafting Chicks, The Pretty Blog and more. And here's another one you don't want to miss from The Superchick herself, Genevieve from Celebrate Today.... the Superchick Way! Gen created this awesome heart memory game - "A Perfect Match," get it? - that's great for kids of all ages. And it is so simple to make. Just print out the game pieces and either use a paper punch or scissors to cut them out. You can stop there or if you want to get fancy with it - as true superchicks do! - glue each piece to some colored card stock. To jazz 'em up even more, add some scrapbook paper to the backs too. Then wrap the pieces up and you're good to go! You can give them out along with valentines or just use them at home. Either way, this is an activity your kiddos will love on February 14th and beyond. To get the full how to and download the free printable games pieces, visit Celebrate Today.... the Superchick Way. And for more V-Day games and goodies, check out my post over at the Valentine's Countdown at Parents Connect. Oh, and don't forget to enter to win some fabulous prizes while you're there! Images: Celebrate Today.... the Superchick Way! There's just one week until Valentine's Day! Have you picked out your cards yet? Planned your get together? I can see you nodding "no" through the monitor. Good thing we've got almost 150 (yes 150!) freebies linked up in our VALENTINE FREEBIE FESTIVAL to help get you started! Today's pick is a simple but totally unique idea from one of my favorite bloggers (Kalleen from At Second Street) who shared it on one of my favorite blogs (Tatertots & Jello) so is it any surprise that I adore it? And I'm sure you will too. Without further ado, I present to you..... Love Juice Valentines! Are they super cute or what? To make them, Kalleen took regular bottles of water and covered the labels with wrapping paper. Then she printed these heart labels onto card stock. And these love juice tags onto file folder labels (you could also use sticker paper). She stuck them onto single serve Kool-Aid packets, punched holes in the top and tied the packets along with sassy striped paper straws to the top of the water bottles and voila! You can download all of the free printables to make your own Love Juice valentines here at Tatertots & Jello, and if you have a free Valentine's printable you'd like to share, enter it into the link up below! See this adorable charm bracelet? Can you believe it was made from these? Yup - stickers! Get the full how to at - where else? - Martha Stewart. Or you can create some fun felt heart hair clips with the tutorial at The Purl Bee. For more cupid-inspired accessories that will make your kids swoon, head on over and check out my post over at the Valentine's Countdown at Parents Connect, and while you're there, enter to win some fabulous prizes! Picture Perfect For February 14th! The Valentine's Countdown that I'm hosting over at Nickelodeon's Parents Connect continues today with lots of fun ideas for staging your own Valentine's Day photo op. Whether you want pictures for cards or to put in the family album, you won't want to miss these great ideas from Anders Ruff, Paper & Cake, J. Crew, Martha Stewart, 24*7*365 and I Heart Faces! And just to show you the possibilities, here are a few more options I know you'll love. Draw some signs for your kids to hold like Kellie from This Blessed Nest. Who cares if everyone's looking at the camera or smiling? The silly shots are just as sweet! Make your own heart-shaped chalkboard to write a sweet nothing on, like this one from Martha Stewart. If you have older kids, take a cue from J. Crew's Crewcuts' catalog and try laying them on the floor with candy or cupcakes forming fun shapes around them. Or copy this fun idea from Color Me Katie. Take a shot of your child blowing a kiss. And then draw in some hearts. 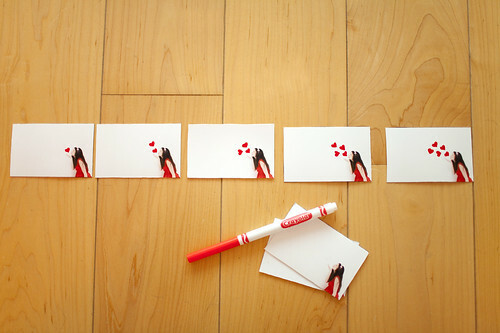 You can write a love note on each one or attach them together to make a kiss flipbook. 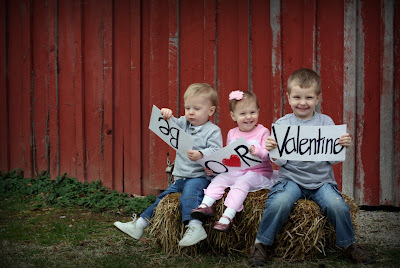 If you like what you see here, make sure to check out my post with more fantastic photo op suggestions over at the Valentine's Countdown at Parents Connect and while you're there, enter to win some fabulous prizes! Today's pick from the VALENTINE FREEBIE FESTIVAL will help you throw a super sweet Valentine's Day get together, just like this one. Delightful Designs created this I LOVE YOU (A Bushel and peck) printable package and I adore the red and blue color scheme, the love birds and the mod patterns. Best of all, this package makes putting together a party easy peasy. Just add the food labels and straw flags to simple red, white and blue foods - like the heart cookies, cupcakes, sodas and candy you see here - hang the banner and your soiree is ready to start! It really doesn't get any simpler than that! You can download the free printable I LOVE YOU (A Bushel & a Peck) package here at Delightful Designs, and if you have a free Valentine's printable you'd like to share, enter it into the link up below! Get Your Valentine's Day Party Started!